The first photo of Leonor,Sofia, Irene and Victoria Federica is adorable! Thanks for posting! I haven't seen this picture before, does anyone know what event it was taken at? 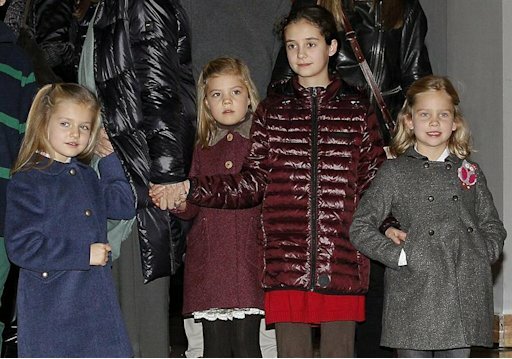 The Queen, Princess of Asturias, the Infantas Leonor,Sofia,Elena,Cristina and their children attend the "Sound of Music" on December 22nd in Madrid. The cover photo showing Letizia keeping her distance, the Queen is the only person who looks genuine in her happiness, Cristina looks horrific, Elena came to support the re-integration of her sister, a controversial strategy anyway. Letizia will have been there for the sake of her daughters, not isolating them from their cousins. Cristina's older kids know exactly what is going on and look pretty uncomfortable. From many photos they chosen the worst with Letizia standing apart. But to be honest everyone knows that this family has problems (Inaki's case, King's lover, dead marriage of JC&S) so I'm not surprised that they're not look too happy. Pity because of the Cristina's children, looks like they know what is going on. This surely hasn´t been a pleasant Christmas in the Royal Household. From many photos they chosen the worst with Letizia standing apart. It looked like Hola's cover was Letizia's initial reaction regarding the whole family posing on the step, what's the point of doing that ? They hadn't done that in the previous years when the family went out together during the Christmas break. Sofia has been trying too hard to 'white wash' the image of the Palms, she should have know better at this moment it's useless. Felipe had never missed the family (Christmas) events until this year, why ? The reason is quite obvious IMO. Completely agree. 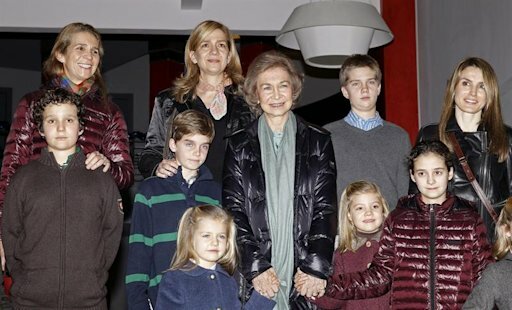 Queen Sofia wants to play happy family and although I think the happiness around her grandchildren is genuine, she used the event to continue to bring Cristina back into the family. Letizia had no chance to go with it because she is an SRF woman and cant keep her children under wraps but Felipe opted out. I read on Vanitatis a while ago that the Palmas hired an image advisor regarding their public appearances, I wonder who is paying for such an agency, they usually dont come cheap. 10 photos of the "annus horribilis" of the Spanish Royal Family, in Semana.